Kia wants to cash in on America's insatiable SUV appetite. Like many other automakers, Kia is cashing in on the crossover craze. 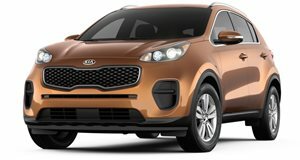 Currently, the Korean automaker sells the Soul, Niro, Sportage, and Sorento in the US. These models will be joined by the three-row Telluride this spring following its debut in Detroit last month. And yet somehow, Kia has found yet another crossover niche to fill. Kia’s new compact crossover was previewed last year by the SP Soul Concept, and while it was designed for the Indian market, it will also be sold in the US. Testing already appears to be underway, as our spies have spotted a camouflaged prototype of Kia’s new US-bound crossover being taken for a spin in the snow. Kia hasn’t officially announced a name for its new compact crossover yet, but rumors suggest it will be called the Tusker. The prototype is heavily camouflaged, but we’re hoping the production model will retain the concept’s sporty styling. The shape of the headlights will likely be different, as will the design of the bumper. We also suspect the prototype’s fancy wheels are only being used for testing purposes. Under the skin, the Kia Tusker will ride on the same platform that underpins new Hyundai Creta, which is also designed for the Indian market. Technically, this architecture is capable of accommodating seven seats, but Kia’s new crossover only offer five seats like the concept. In terms of engine options, Kia’s new crossover is expected to be offered with either a 1.4-liter turbocharged gas engine or a 2.0-liter naturally aspirated unit. The US model is more likely to receive the latter option, mated to a seven-speed dual-clutch automatic. Since it will presumably be positioned below the Sportage, the Tusker is unlikely to be offered with AWD, however.